Summer is great for enjoying nature, but there's just something about fall – the crisp weather, the scent of a wood fire burning, the frenzy of college football – that seems to fire up the adventurous spirit. Fortunately, festivals abound this time of year that cater to those of us who'd rather enjoy the brilliant foliage from the saddle of a bike than the backseat of a car. Here, some picks for fall festivals with adventure front-and-center. Extended to four days this year, this gathering at one of the country’s top mountain biking meccas encompasses all the essentials of the sport: biking, beer, and revelry. Sponsored by the local Chile Pepper Bike Shop, the festival also features a film component, with evening showings of movies featuring independent mountain biking footage. Rounding out the action is a Hot Pepper Eating Contest and Ridiculous Costume Party that promises plenty of photo ops galore – all for the bargain price of just $35 for a festival pass. OK, so the adventure happens on-screen, but there’s no better way to fire you up for a killer run, monster ride, or epic wave than watching other adventurers, athletes, and adrenaline junkies do it – and, more often than not, changing the world for the better in the process. This year’s incredible list of films chronicles surfers riding a 50-foot wave in Northern Island, cancer survivors learning to rock climb and kayak, and a group of climbers missing various limbs successfully ascending Zodiac, a 1,800-foot route on the southeast face of El Capitan. The third edition of this annual event invites newbies and seasoned paddlers alike for a weekend of water exploration way down upon the Suwannee River and the enchanting Lower Suwannee National Wildlife Refuge. Guided paddles through natural salt marshes and tidal flats where the famous river meets the Gulf of Mexico offer the chance to see wildlife like bald eagles, West Indian manatees, and white-tailed deer that inhabit this 53,000-acre landscape. The festival also includes paddling instruction and talks from wildlife and nature experts. Advance registration is required for guided paddles, and some nearby accommodations are offering discounts for festival participants. “Street Fair” is a euphemism for one of San Francisco’s most outrageous festivals, which bills itself as a celebration for sexual expression but is really just an excuse for exhibitionists and kinksters to perform and parade around in various states of undress without fear of arrest, while vanilla onlookers wander, wide-eyed, through the debauchery. The sexed-up scenes range from jaw-dropping to cringe-inducing, with public displays of just about any human act imaginable. 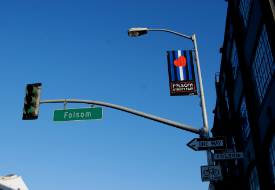 Gay-friendly but welcoming for people of any (imaginable) orientation, Folsom isn’t advisable for prudish types, but, if you do decide you’re up for it, gather a group of equally open-minded friends and get ready for some – ahem – bonding like you’ve never imagined. A few tips for Folsom first-timers (i.e., yours truly, last year): Sunglasses are great to hide behind while you gawk; ask (and smile) before you snap photos; and drink – a lot – to help dull the senses.